CEOs Are Rewarded for Keeping Their Employees in Poverty. It’s Time to Change That. 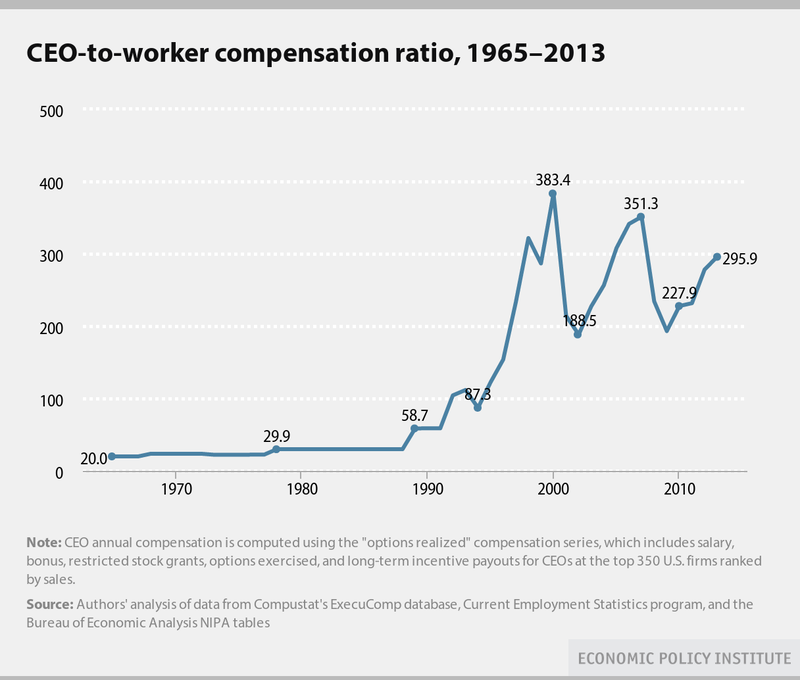 CEO pay has increased by almost 1000% since the 1970s, while pay for working families has languished. Via Trey Ratcliff Flickr Account. For most American families that income is a pipe dream. Since 1987, pay for the average worker has barely budged while the cost of everything — milk, gas, college tuition — has gone up and up. Families got squeezed as prices rose and paychecks froze. Communities of color have been especially hard hit by the decline of the middle class. African Americans are more likely to live in poverty and experience unemployment. Seventy percent of African Americans who grow up in middle income families will see their personal income fall below their parents. Languishing wages force families to choose between necessities: a secure retirement or sending a child to college? Repairing a leaking roof or a broken car? Back-to-school shopping or replacing a winter coat that’s too small? Paying the rent or buying groceries? Few realize that CEO bonuses and “performance pay” are subsidized by the American people. Corporations are given major tax breaks for providing exorbitant compensation. Surely we can agree that corporations don’t need taxpayers to subsidize massive CEO pay — pay that’s grown nearly 1000 percent since 1978. In America, corporations and executives are playing with a deck stacked against hardworking families. And the Republican response to this profound income inequality has been a collective yawn. It’s wrong for any business to keep workers in poverty while padding CEO’s wallets. It’s even worse that some of these same businesses take huge tax deductions for millions in bonuses. My bill, the Income Equity Act, prohibits employers from taking tax deductions for excessive compensation — defined as any pay more than 25 times that of the company’s median wage worker or $500,000. Congress should get to work for hardworking families, not millionaires and billionaires that want to get even richer on the backs of taxpayers. Hi! I'm Congresswoman Barbara Lee, and I proudly represent California's 13th Congressional District in the US House of Representatives.